With summer holiday quickly approaching, I've got summer style on my mind. Just before last summer, I acquired some fun vintage culottes which I brought with me on my travels. I'm thrilled that culottes continue to be a trend for this summer. I've seen a few different variations -- some slightly shorter versions (almost like a long Bermuda short) and then a more billowy and full version, great for dressing up. Culottes are great for travel because they're so versatile. You can dress them down casually for an afternoon stroll along the boardwalk or dress them up for a summer wedding, both very likely events for summer vacation. First and foremost, think carefully about footwear. To look chic in culottes, I'd suggest wearing some cute heels or some block heeled sandals. They provide a lovely feminine silhouette and are a good balance for the fullness of the culotte. Of course if you're going for a more casual look (with denim), then keep those ankles bare and wear some cute white lace up Vans or Keds (or something similar). Second, if you're keen to get your hands on some vintage or vintage style culottes with a high waist, then I'd definitely suggest wearing a cropped top (or something that has a nice drape to it). Your other alternative would be to wear a lovely silk top and tuck it in. Again, to create a balanced look, you want a nice strong waistline to off set the fullness of the culotte. Finally, I'd suggest going bold with pattern and finding a wild pair of culottes in a flowy fabric like rayon. If you go this route, then keep the rest of the outfit neutral or plain and let those awesome culottes make a statement. All these pairs of culottes seen in this post come from Rue Madame. They're an online boutique with a few store locations which aims to give ladies a Parisian shopping experience here in Hong Kong. Think elegant, classic and understated charm and you'll find it here. 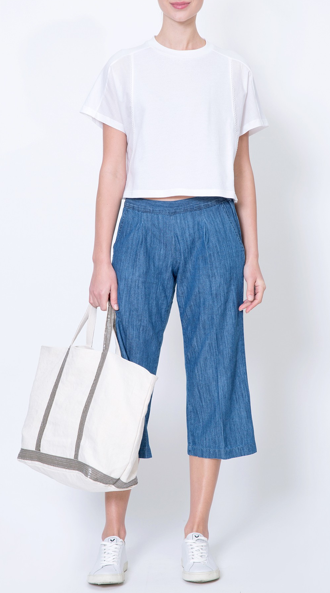 Seriously, have a look at their selection of culottes and consider packing yourself some for your summer travels. ***This post was written in collaboration with Rue Madame. Love this! Glad I'm not the only one excited about summer fashion. I just laid out all my summer clothes to hang up in my closets since we have a heat wave in New York... I love how you explain how to wear them. They seem like the type of piece that may be just a touch tricky on how to style. I've got to get a vintage pair asap. I think I really like the shorter length. To be honest, I feel kind of done with culottes, BUT these printed versions--now that's something new! I love both of the options you chose to highlight here. I wanna mix this trend up and choosing a crisp patterned fabric version seems like the perfect way to do that!